Blueberries are one of the few native North American food plants that have gained favor around the world. Plant breeders have selected many varieties over the years, from early blooming and fruiting to late with various flavors and levels of sweetness and tartness. We carry 'Duke' (early, mildly sweet, heavy), 'Bluecrop' (mid, sweet, large fruit), and 'Aurora' (Late, mild, fine quality). Ideally, several should be planted fairly close to one another to provide better cross pollination, and a succession of fruit. There's nothing as tasty as a handfull of fresh blueberries and they are full of healthy antioxidants. They are also attractive and can be planted as a hedge around a patio or deck. 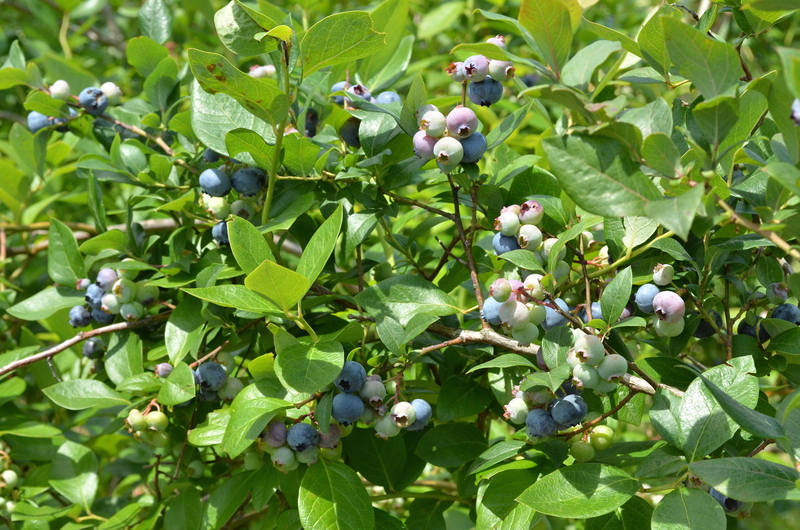 Sun and moist soil are ideal for blueberries, and while they can take shade, sun will produce better crops. Blueberries prefer soil that is acidic. The soil pH should be between 4 and 5. Soil can be acidified with organic matter like peat moss, pine bark or needles, or aged sawdust (especially oak or pine). You can also mix a small amount of granulated sulfur into the soil several months before planting. Blueberries are shallow-rooted plants, requiring a moist soil that doesn’t stay overly wet, although we have grown them in boggy conditions. Plant as early in the spring as possible, digging holes about 18 inches wide and deep, or about twice as wide and 6” deeper than the roots of the plant. Blueberries don't favor drought, so keep them well irrigated. We currently carry 3 gallon, 3-4 year old plants, ready to go. You can leave them in the pots for a year, or plant them now! We will also have native species high bush and low bush blueberries, availlable in June.